D- Long press to shut down. 5 Suitable for: Wallet, Car, Kid, Pets, Bags, Suitcase or other belongings. Bluetooth Finder: New Coming in this summer. Smart Finder built-in Bluetooth 4.0 LE Tech to effectively protects your valuables like phone, key, wallet, pet, ect. 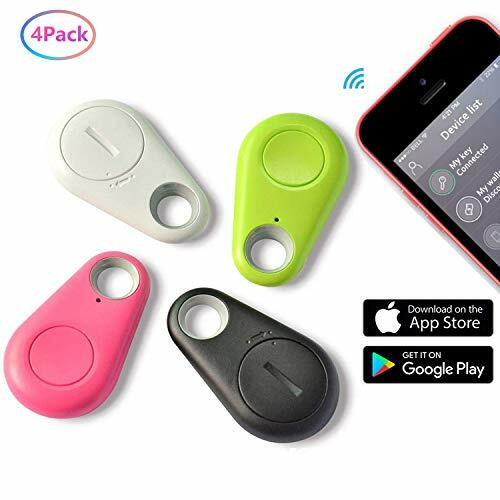 Your valuables or pets from being lost or stolen within 75 Feet/25M effective distance range, when out of this range your phone and this device will automatically ring for a timely warning. Intelligent Search: Through precise calculation, locate your pet via digital display, and you can also press the calling button to let the device make sound. Compact size and lightweight design and low energy consumption, handy like a key ring, easy to carry and use, Keep Your Valuable Things Safe and Within Your Range. Remote Control: You can remote control the device camera or voice recording of your phone by press a button. It can take awesome wide angle selfies from your front or rear facing cameras. Works as a remote shutter for self-portrait, capture the happiest moment easily. Portable Design and Convenient: Compact size, lightweight design and low energy consumption. Handy like a key ring, easy to carry and use- Convenient. GUARANTEE: If you are not satisfied with our product, just contact us and we can offer 30 days money back guarantee without hesitates. If you have any questions about this product by Jesam, contact us by completing and submitting the form below. If you are looking for a specif part number, please include it with your message.